Jack Bell Gallery is pleased to present a series of paintings by contemporary artist Boris Nzebo. 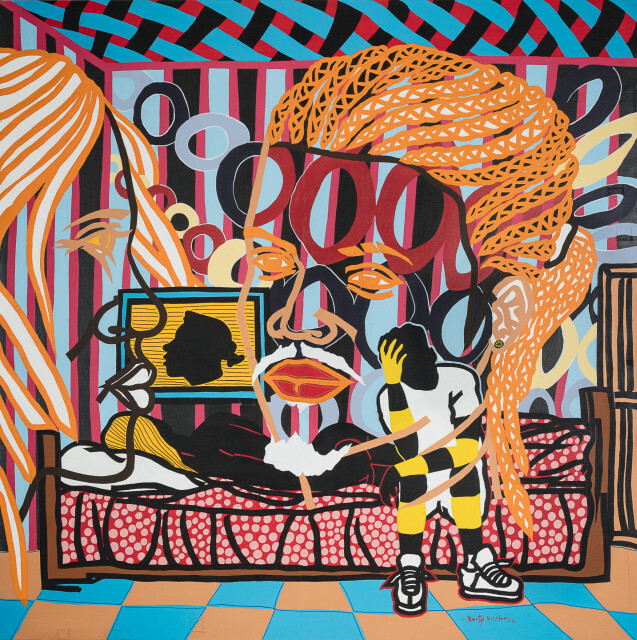 In this new body of work he continues to explore subjects drawn from his hometown Douala, Cameroon’s largest city. This will be the artist’s fifth solo exhibition with the gallery. Nzebo constructs portraits using detailed studies of traditional African hairstyles, layered with informal snapshots of local neighbourhoods, urban architecture and scenes from daily life. The paintings address social and political inequality, individual success being met with persecution in the community, the underbelly of nightlife, moral questioning of adultery and the relationship of hairstyle to personal expression and identity. Born 1979, Port-Gentil, Gabon, Nzebo lives and works in Douala, Cameroon. Manchester Art Gallery hosted a solo exhibition of his work in 2016. A piece was subsequently acquired for the museum’s permanent collection and exhibited in 2017. Previous group exhibitions include ‘Pangaea’ & ‘Pangaea II’ at the Saatchi Gallery, London.